The automotive domain is a good example where a lot of effort is put into reducing man’s impact on the environment. A recent initiative of BMW is a car sharing project called “DriveNow”. 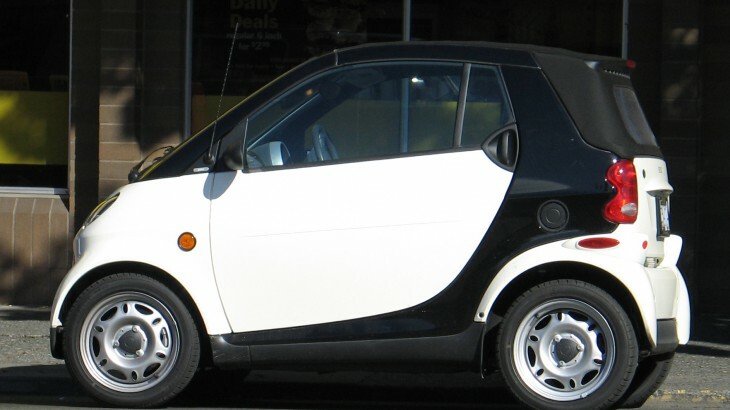 It provides easily accessible short-term rental cars that are available all over a city. 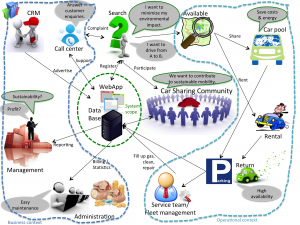 This example analyzes the applicability and usefulness of a generic sustainability model in its instantiation for a case study of the car sharing system. The car is provided by a company, you register online or at the company’s site. 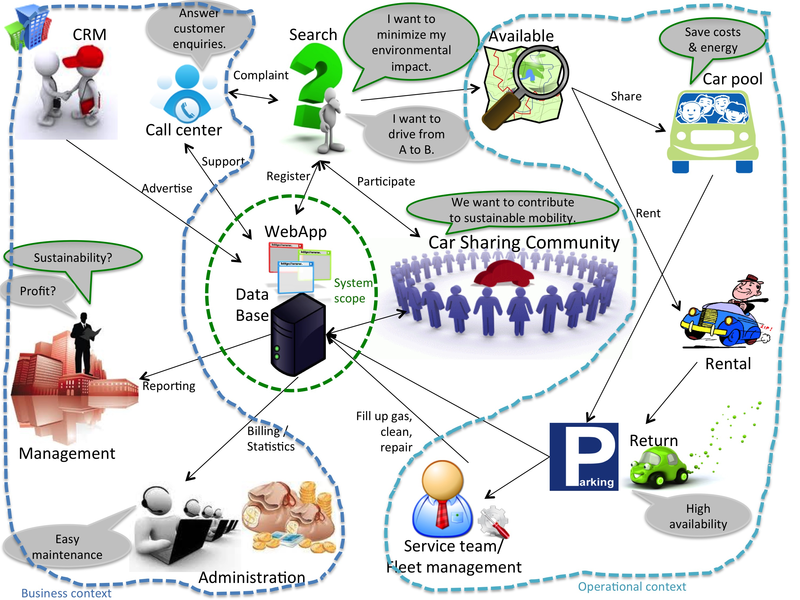 The customer receives an ID, locates the car via the web or an app. It can be parked anywhere inside the operating area of the car sharing service. If the car is parked outside this area and the customer wishes to complete his rental agreement, a relocation fee has to be paid for returning the car to its operating area. 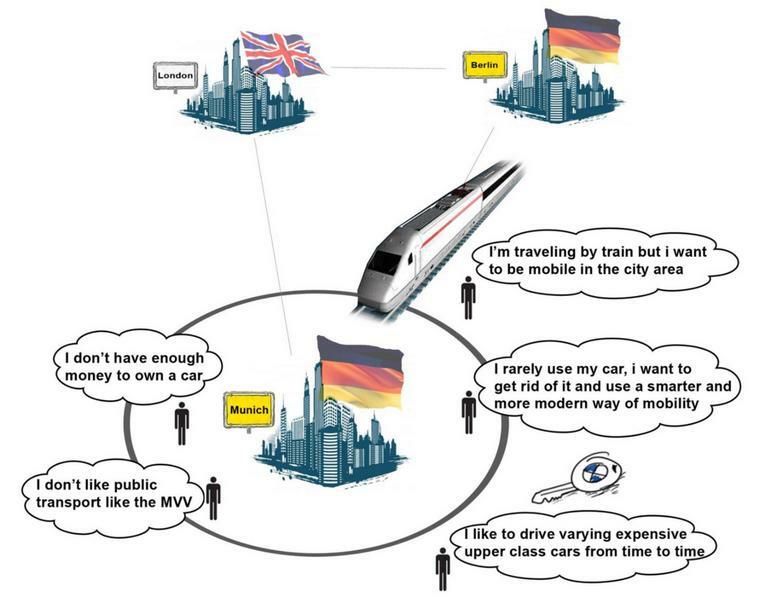 The mentioned car sharing service is implemented by two German car manufacturers, the Daimler AG and the BMW Group. This study case focuses on the implementation of the BMW Group’s platform, with their car sharing service “DriveNow”. In the first step of the analysis we need to initiate the generic values using the goals we defined in the case study. 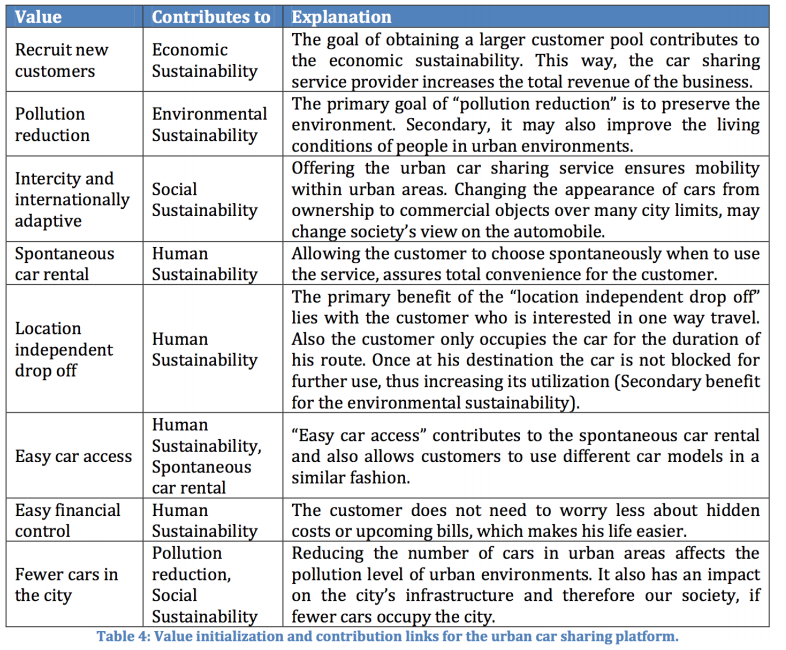 The development process for the urban car sharing platform is explained in the following table. In the second step of the sustainability analysis, we are looking for activities, indicators and regulations that affect the values, determined in the first step. First we only look at the model from an overview perspective. 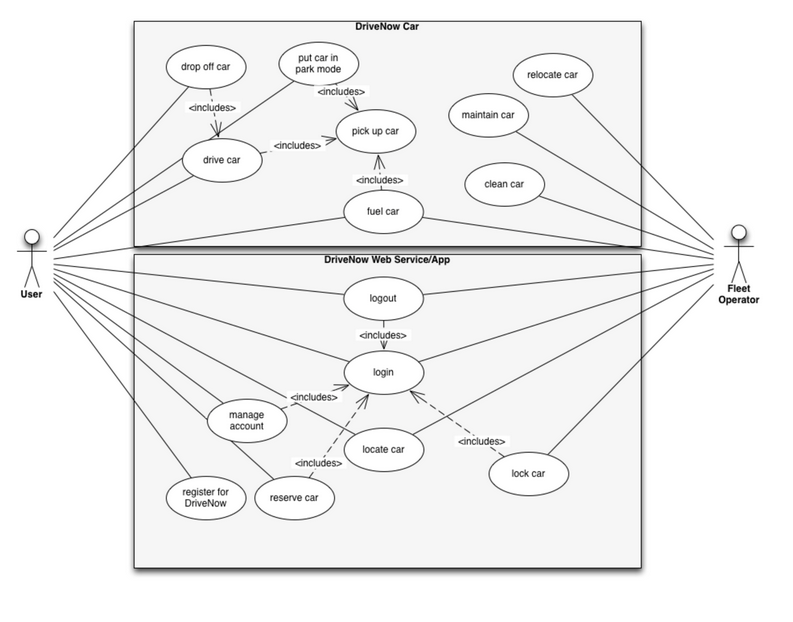 This will allow for the identification of patterns that emerge within the model. As a first reference point the case study was used to identify activities. Again, not all information necessary to initialize the activities were included in the case study. Also the indicators and regulations had to be defined according to the Values, which were also not acquired in the case study. 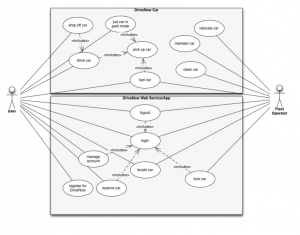 The results are shown in the following instantiation of the sustainability model. The green elements of the model are activities that were added because of the sustainability analysis. These items were not included in the case study. These activities have been overlooked or were not considered due to the missing values already identified in the first step of the modeling process. 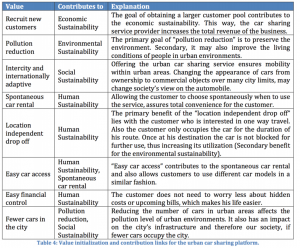 The following table contains the direct and indirect links found in the urban car sharing sustainability model. The results of this step present us with another advantage using the sustainability model. 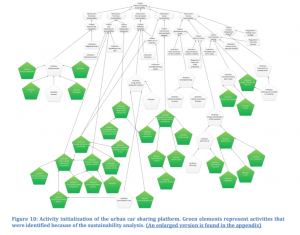 Through identifying direct and indirect influences between activities and indicators, we can specify further implementation constraints in the RE content model for the urban car sharing platform. Indirect influences are depending on the implementation of the activity, whereas direct influences leave more leeway for the implementation. After the third step of the instantiation of the sustainability model we now have a model containing all the indicators that need to be monitored throughout the development process to fulfill the sustainability constraints. DriveNow is a smart system, developed by BMW, for individual mobility and cost efficient travelling. It brings new flexibility for city and suburban people. It can help to modernize the overall carpool by enabling drivers to dismiss their old car in favor for a more economical sharing model, and helps therefore to promote emission reduction. DriveNow offers the possibility to reach new customers in different ways: On the one hand it provides access to individual mobility for price-oriented customers. On the other hand it reaches new customers who need a car only occasionally. In conclusion we have seen that the sustainability model for the urban car sharing platform produces some additional goals for the RE content model. In this case we found the additional goals “low maintenance susceptibility” and “vehicle independent integration”. The resulting activities provide an additional layer of depth to the RE content model, by illustrating the composition of the goals according to their sustainability features. The identification of activity patterns provided us with the knowledge of weaknesses within our system. Certain activity patterns threaten the sustainability due to their relaying on single activities that, if threatened, can destabilize the sustainability of the entire model (e.g. electric car). After also identifying direct and indirect influences between activities and indicators, we can now proceed with the assessment of the sustainability model, by looking at a real world example. As mentioned before, the case study used for the urban car sharing sustainability analysis is modeled after the real world example “DriveNow” from the BMW Group. As also mentioned before, it is very difficult to obtain any kind of sustainability data from real world applications that do not monitor the indicators relevant to the sustainability. Case Study, Example Automotive, Embedded, Environmental Sustainability, Goals, Smart Systems, Social Sustainability. permalink.